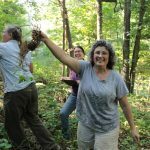 Appalachia’s forest are home to a stunning array of medicinal plants. A movement called forest farming is emerging to grow these plants in private forestland to decrease strains on plant populations and strengthen the market for the region’s botanicals. As climate change begins to impact Appalachia, scientists and community activists look for ways to study and adapt to the changes.